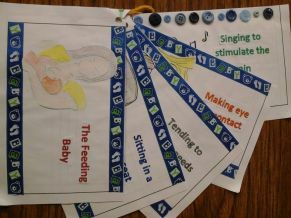 Nearing the end of my unit on infants, I was in search of a creative idea that encompassed all that I had covered in regard to meeting the needs of babies. Below is the project I developed, assigned my students and then crossed my fingers. I’m never sure how a totally new project is going to be received, not to mention what kind of work I will get in return. Needless to say I should not have worried as my students, were not only completely engaged, but turned out some creative, well written post cards! Discuss Maslow’s Hierarchy of Needs by filling in a tiered pyramid with the human needs: physical needs, safety, love & belonging, esteem and self-actualization. We talk about the importance of these needs and how upper level needs cannot be fulfilled until the lower level needs are satisfied. We talk about examples of needs for their age level. Once students understand the hierarchy of needs concept, I ask them to apply it to infants since they are not capable of meeting their own needs at this stage of their lives. Parents and caregivers are responsible for making sure an infants needs are met. Then I explain to students that they will write letters to their future baby explaining how they as parents plan to meet their needs. 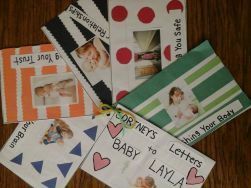 The categories include: Nourishing, Safety, Relationships, Trust and Brain Development. Throughout the unit we discussed breast vs. bottle feeding, baby food, safety especially with shaken baby syndrome, love, bonding, trust and brain development. 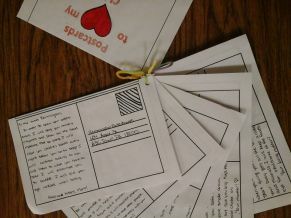 Students are expected to use their notes and resources to help them write their letters. See guide sheet for specific details. Awesome, creative Idea. Thanks so much for sharing!